The UK’s business telecoms purchasers, typically tied into three year contracts, have little faith that BT will deliver its £10 billion Next Generation communications Network by its 2011 deadline, according to research conducted for ntl:Telewest Business, part of the Virgin Media Group. Just three in five questioned were aware of 21CN, which will see BT’s entire UK network replaced, a ‘radical vision’* that will eventually impact every UK firm that uses the network. Of the network and telecom managers questioned who were aware of 21CN just 27 per cent believe BT will deliver the mammoth project on schedule. Nearly forty per cent of network purchasers believe that BT will be one to five years late in switching all of its customers from its legacy network to its Next Generation Network. ntl:Telewest Business has already completed its Next Generation UK-wide Network. However, the survey highlighted low awareness of who owns the networks that provide telecoms services. Asked which providers have a UK telecoms network, only 77 per cent cited the former monopoly provider while 11 per cent referenced ntl:Telewest Business. Three in five said the telco’s ownership of its own network infrastructure was a critical factor for telecoms services. When quizzed about what BT was promising with its Next Generation Network, 61 per cent of network purchasers cited improved network speed. 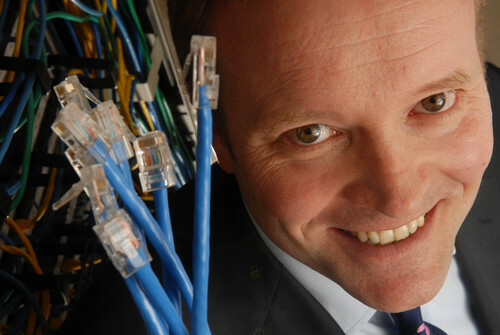 However, recognition of the improvements to existing technology services are hazier, just 35 per cent cited increased efficiencies, 27 per cent believed it would improve networked IT services, 18 per cent identified true convergence for voice and data services, and just two per cent believed it would enable a mobile workforce. “Many firms do care about the sophistication and speed of the network that connects their sites to each other or to the outside world because they’re so dependent on it. We already have a three year technological lead over BT with a network that brings Next Generation services directly to most business premises,” said Mr Beynon. Network and telecom managers were questioned over which technological enhancements their company would most benefit from by switching to a Next Generation Network. Enough bandwidth was ranked the number one benefit with 86 per cent. Availability of voice, data, video on any device at any time came in second place with 67 per cent. Sharing your contact directory across your work phone, personal phone, PDA and computer scored third place with 63 per cent. Moving seamlessly between the written and spoken word on a call scored 54 per cent. More than half (55 per cent) of IT managers considered the availability of a Next Generation Network to be an important telecoms purchasing consideration. In fact, more than 35 per cent of companies said they would consider switching to a UK-wide Next Generation Network that is available today, rather than waiting for BT’s 21CN network. This figure rose to 63 per cent among smaller firms (50 to 99 employees). “It is not just about how sophisticated the network is. Customer service was still ranked the most important factor in the telecoms purchasers’ decision making score card. To provide our customers with a more personalised customer service, we segment customers by region, meaning we place key account management teams on the doorsteps of businesses across the UK. And, we value this asset just as much as our Next Generation Network,” said Mr Beynon. ntl:Telewest Business offers the only alternative UK-wide fixed-line telecommunications network to BT, and has already upgraded it to Next Generation Network technology to deliver new levels of sophistication and speed. With more than 38,000 street cabinets directly connecting more than 190 cities and towns, ntl:Telewest Business can reach most businesses in the UK without resorting to third parties for the last mile. 2Europe interviewed 200 telecom and IT managers for ntl:Telewest Business across public sector, finance, retail and media organisations, with between 50 and 500+ employees, between 5 and 18 March, 2008. If you would like high-res images to accompany the press release these are available for download via VisMedia (http://www.vismedia.co.uk) or you can contact the ntl:Telewest Business PR team on 0207 494 6570.
ntl:Telewest Business has the most technically advanced of the UK’s two national networks. Its vast nation-wide Next Generation Network provides businesses, public sector organisations and service providers across the UK with a complete portfolio of advanced data, internet and voice services. The £13billion network is flexible, scaleable and is already built out to more than 38,000 street cabinets across the UK. As part of a commitment to deliver superior customer service, ntl:Telewest Business sales and support teams are located in close proximity to its customers in over 40 centres across the UK. ntl:Telewest Business is trusted to provide critical communications to high profile customers including: Birmingham City Council, Yorkshire Water and EasyJet. This press release was distributed by ResponseSource Press Release Wire on behalf of Speed Communications in the following categories: Business & Finance, Computing & Telecoms, for more information visit https://pressreleasewire.responsesource.com/about.